If you grow peaches, you have most likely experienced peach leaf curl. Recognizing the symptoms of this infection and understanding what to do about it can help you keep your peach crop peachy keen. Peach leaf curl (Taphrina deformas) is a fungal disease that infects the immature leaves of peach and nectarine trees and it is often far worse in years with a cool and rainy spring, conditions that allow this fungus to spread more rapidly. The yearly disease cycle begins at bud swell and continues until the young leaves emerge. The infected leaves turn reddish-brown, pucker, shrivel and fall off the tree. With fewer leaves, the fruit crop is not nourished as well and fruit will be smaller and less productive. On rare occasions, the fruit itself may become infected and will show a scabbed, corky surface in patches. After the initial infection, the velvety spores are carried by the wind and rain, overwintering in the tree bark to infect the tree again the following spring. Repeated infections will lead to branch die back and eventually shorten the life of the entire tree. 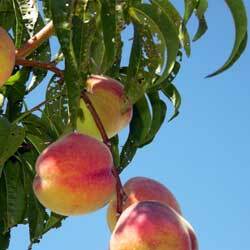 If you are considering growing peaches, choose a leaf curl resistant variety of tree. There are both new resistant varieties as well as resistant heirlooms. If you are already growing peaches, keep your tree healthy with proper and regular pruning that will allow adequate air circulation and sunlight between branches to minimize the damp, cool conditions that help this fungus. Proper feeding and watering of your tree will also help it be more disease-resistant. If the disease presents itself, apply fungicide every year in the fall after the leaves have dropped. In areas with wet winters, it can be helpful to reapply fungicide in early spring before bud swell. Always rake up and destroy the infected fallen leaves. Safer recommended controls include sulfur and copper-based fungicides. Traditional control products include Daconil and Ferbam, and should be used according to the application instructions. If the infection is localized to just a few branches, it may also be possible to prune away those infected branches in late fall to help minimize the spread of the spores. Peach leaf curl can be devastating to your peach trees, but if you recognize the disease quickly and take proper steps to minimize its effects, you can keep your trees healthy and protect your crop of sweet, delicious peaches. This entry was posted in aaa, Early Spring, Tips, What's Bugging You on March 10, 2015 by admin.